All transactions are safe and secure with a reliable history in online purchasing behind each of our associates. 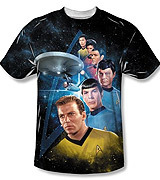 Buy the Star Trek Classic Crew t-shirt to own Star Trek clothing and merchandise. After having seen all Star Trek episodes and movies, is the original crew still your favorite? Then this tee is for you. This Star Trek t-shirt features crew members from the Star Trek original series that aired from 1966 to 1969. William Shatner, Leonard Nimoy, DeForest Kelley and the rest of the gang indisputably made this franchise what it is today. Purchase it with a classic Star Trek uniform shirt. In addition to the Star Trek Classic Crew tee above, browse the Star Trek Clothing Gallery for more apparel like men's and women's clothes, kids shirts or hoodies.